Of European origin, often known as P. canescens Besser, first collected in Michigan in 1896 at Whitmore Lake (Livingston or Washtenaw Co.) and apparently well established by the 1920’s and 1930’s as a weed of sandy roadsides and fields, railroads, and exposed rocks. The leaflets are very similar in shape to those of P. recta (narrowly cuneate at the base, rather than the more rounded shape of P. norvegica), although averaging a little smaller; but they are gray-tomentose, with intermixed long hairs, on the lower surface. 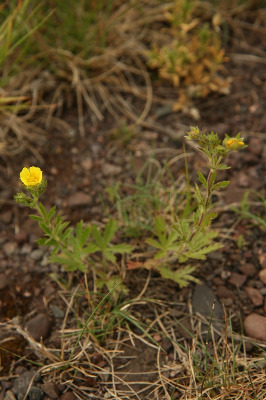 The flowers are smaller than in P. recta, with deeper yellow petals (as in P. argentea). The intermediate nature of these plants has led to the suggestion that they may be of hybrid origin. MICHIGAN FLORA ONLINE. A. A. Reznicek, E. G. Voss, & B. S. Walters. February 2011. University of Michigan. Web. April 21, 2019. https://michiganflora.net/species.aspx?id=2507.